by Ernest Jones September 13, 1906---Alberto Santos Dumont, a Brazilian resident in France, famous for his experiments with small airships, made the first recognized airplane flight in France, on of 7-8m. at Bagatelle, in his XIV-bis (Antoinette 50 h.p. ), after experiments with the helicopter. November 12, 1906---Flew 220m., officially observed, in 21.2 secs., winning the Archdeacon Cup and the Aero Club of France prize of 1,500 F. for the first flight of 100m. FIRST "OFFICIAL" DURATION AND DISTANCE RECORD.
' Five other flights were made this day of 40, 40, 60, 50 and 82.6m. 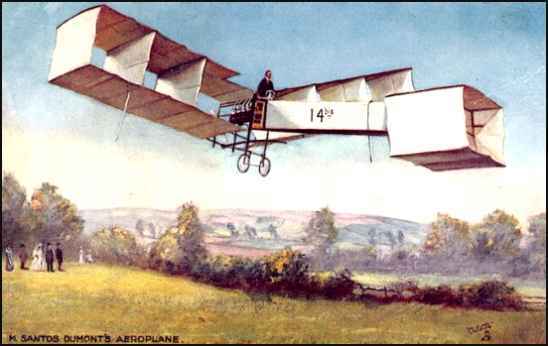 The winter was spent in building a new machine, though his next flight was at St. Cyr, on April 4, 1907, 50m., in the XIV-bis of 1906. 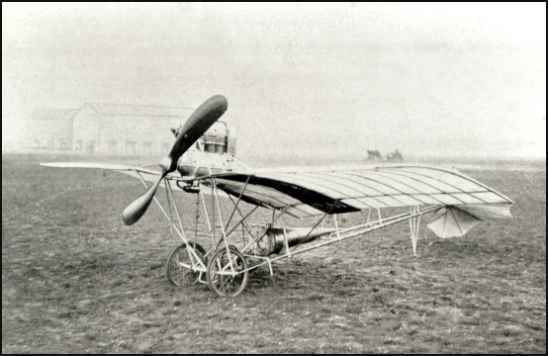 Trials went on at same time with the new machine XV (Antoinette 100), a headless biplane with sharp dihedral in wings like XIV-bis, a tractor this time, with elevators on outer forward corners of dihedral main planes of wood instead of fabric, biplane tail enclosing two vertical panels. The tail acted as both elevator and rudder, being mounted on a universal joint at the end of bamboo outriggers. No flights appear to have been made, though trials began March 22, 1907. 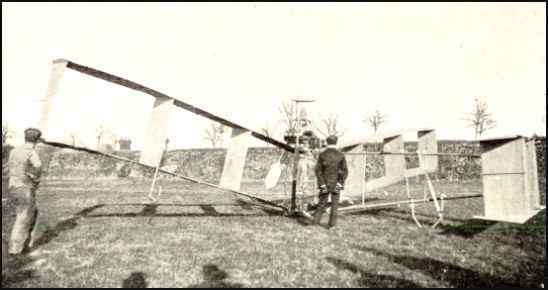 November 16, 1907---With this machine were made flights of 200m., 100m. and 200m. at Issy on November 17, among others. Flights were continued at various times through 1909, including the FIRST CROSS-COUNTRY flight one of about eight kils., from St. Cyr to Buc on September 13, returning the following day, and another on the seventeenth, of 18 kils. in 16 mins. 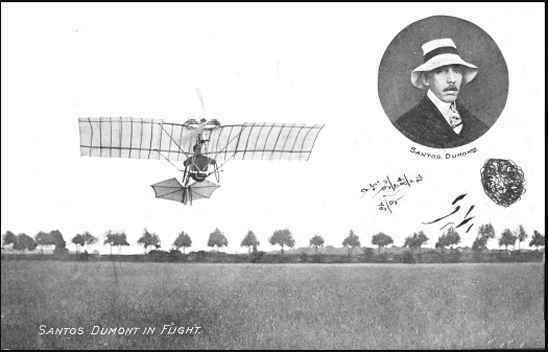 Dumont's name was not thereafter prominently connectied with aeronautics. Nato in Brasile il 20.7.1873 a diciotto anni si trasferisce a Parigi interessato alla meccanica e all'aeronautica. Il suo primo pallone Il BRASIL si innalza destando lo stupore di tutti, ma � solo un inizio; con il SANTOS-DUMONT n. 1. un pallone di forma allungata in senso orizzontale, il primo dirigibile, il 20.9.1898 si alza fino a 400 metri, compie evoluzioni e rientra al punto di partenza. Il SANTOS-DUMONT n. 6 il 19.10.1901 effettua il tragitto Parc de Saint Cloud - Tour Eiffel e ritorno in 30 minuti vincendo il premio Deutsch di 100.000 franchi oro che il grande pioniere devolve per � poveri di Parigi. SANTOS-DUMONT non va ricordato solo per la progettazione a costruzione dei suoi nove dirigibili, tutti differenti, ma anche per due biplani a tre monoplani. Famoso � il suo No. 14bis, biplano di lunghezza m. 10, apertura alare m. 12, peso Kg. 160, motore Levasseur da 50 HP, che il 23.10.1906 decolla e atterra con i propri mezzi compiendo un volo di 60 m., il fatto � eccezionale perch� siamo al tempo in cui altri pionieri usano catapulte per il decollo. 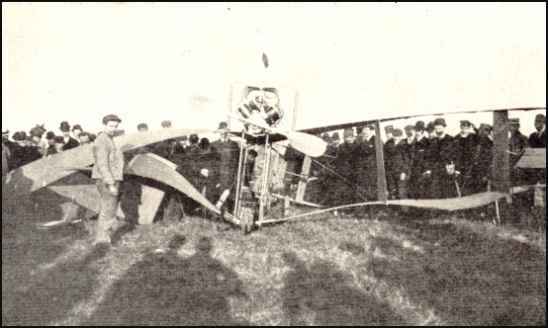 Il 1907 � l'anno del DEMOISELLE un elegante monoplano con cui Santos-Dumont compie il (primo volo tra due citt� da Saint-Cyr a Buc con il record di velocit� di 95 Km/h. Born in Brazil on July 20, 1873, at eighteen years of age he travelled to Paris to pursue his interests in mechanics and aeronautics. His first balloon, the BRASIL, astonished everyone when it flew, but it was only a beginning. The SANTOS-DUMONT n. 1, a balloon in the shape of a dirigible, the first airship, was flown on September 20, 1898 to an altitude of 400 meters, made turns successfully and returned to the point of departure. 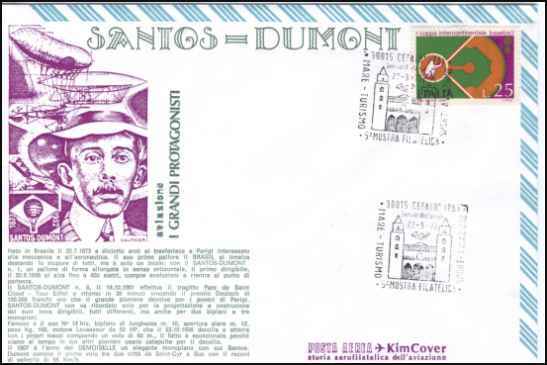 The SANTOS-DUMONT no. 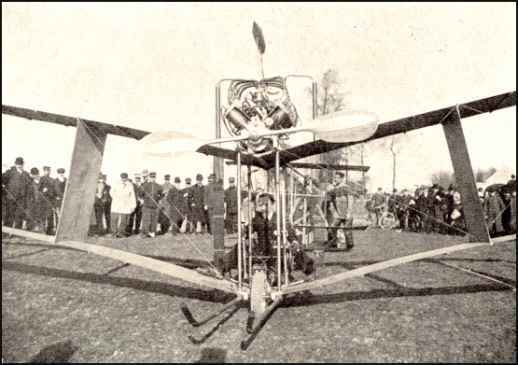 6, on October 19, 1901, flew from Parc de Saint Cloud to the Eiffel Tower and returned in 30 minutes, winning the Deutsch prize of 100.000 in French goldwhich the great pioneer donated to the poor of Paris. SANTOS-DUMONT is not only remembered for the planning and construction of his nine airships, all different, but also for two biplanes and three monoplanes. The most famous is his 14bis, a biplane 10 meters in length, with a wing span of 12 meters, a weight of 160 Kg. and powered by a 50 hp Levasseur motor. On October 23, 1906, it took off and landed under its own power, travelling a distance of 60 meters. It made an exceptional flight at a time when other pioneers had to use catapults for the takeoff. 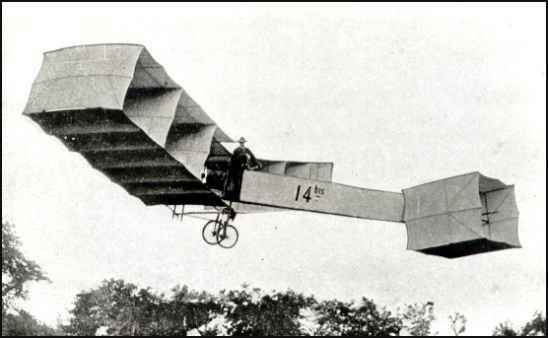 1907 was the year of the DEMOISELLE, an elegant monoplane in which Santos-Dumont completed the first flight between two cities, from Saint-Cyr to Buc, at record speed of 95 Km/h.